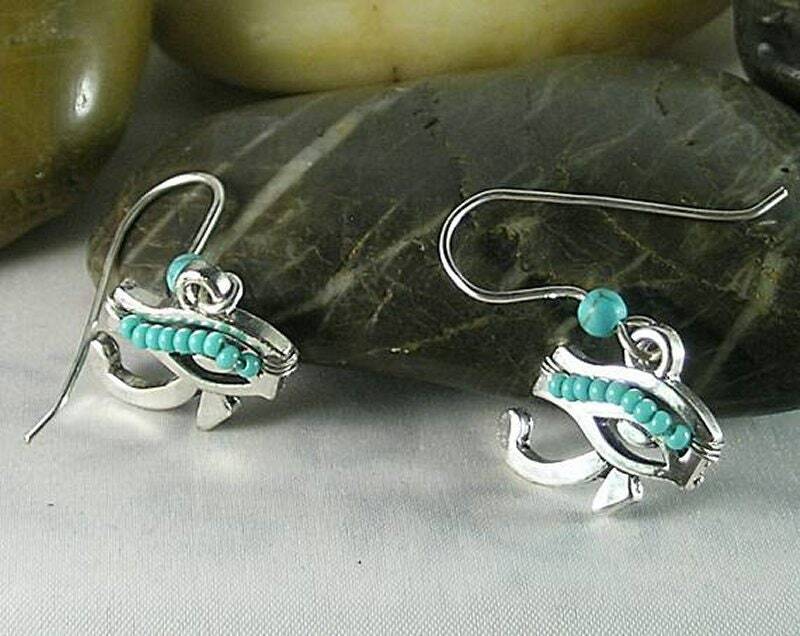 These Eye of Horus earrings are made of silver-plate with small turquoise beads wire-wrapped to the area between the eyebrow and the eye as if it were eye-shadow. The pendant is approx. 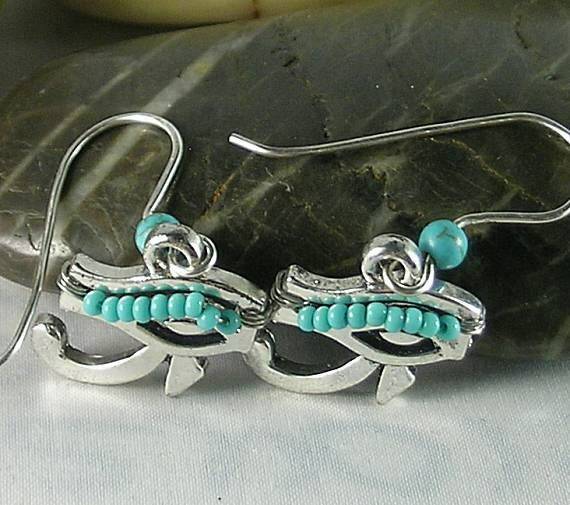 3/4" wide and the overall earring including the matching handmade ear wire measures 1 1/2" (38mm). 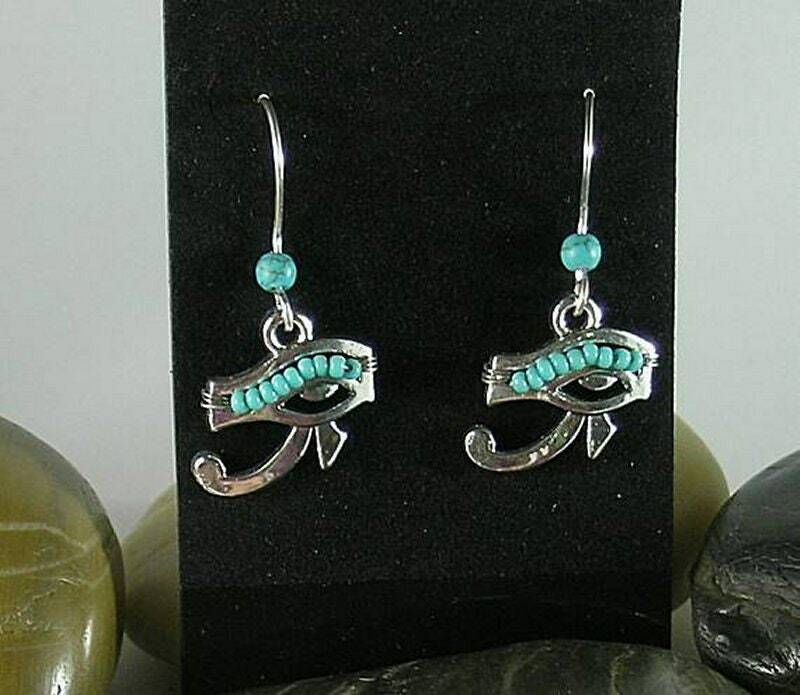 The Eye of Horus, also called the Eye of Ra - It is a symbol of protection, royal power and good health. Horus is the ancient Egyptian sky god was who was typically depicted as a falcon. 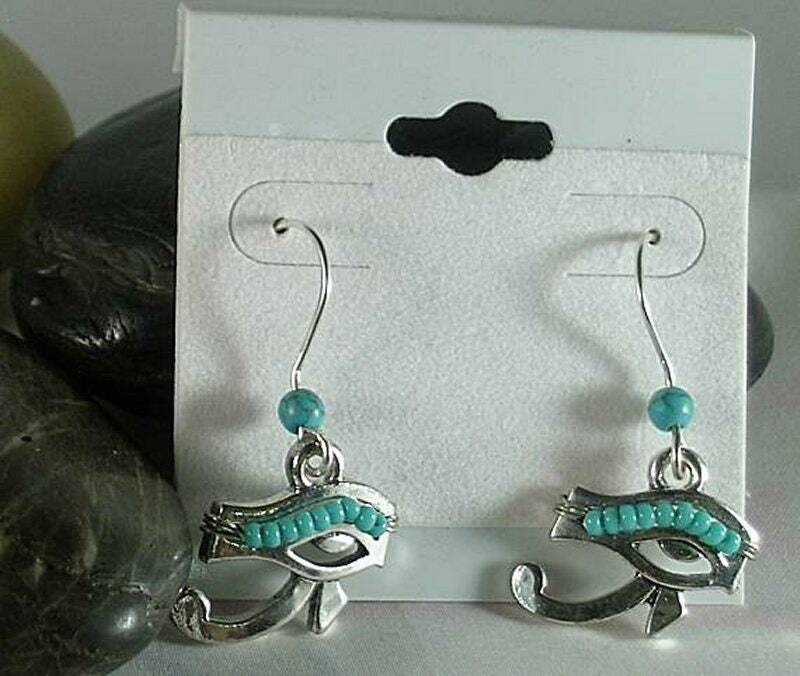 Because of Horus' sacrifice, the eye was often used to symbolize sacrifice, healing and restoration. The eye is personified in the Goddess Wadjet. Wadjet (udjat) is depicted as a human eye and eyebrow as they would be seen looking at a person full-faced. The eye is decorated with the markings that adorn the eyes of hawks. Each part of the eye design has a specific meaning, converging to represent the six senses. The front corner of the eye resembles a nose and is associated with smell, the pupil is sight, the eyebrow represents thought, the left half of the eye is hearing and points to the ear, the curved tail beneath is said to represent taste and the straight line down from the eye is touch like a leg grounding the symbol. Usually, it is the right eye shown as the Wadjet (udjat), although the left is not uncommon. This is probably because of another myth that say that the sun and the moon were the right (sun) and left (moon) eyes of the sky god and the sun is seen as more powerful. The name Wadjet is derived from "wadj" meaning "green", hence "the green one" Wadjet was one of the earliest of Egyptian deities who later became associated with other goddesses such as Bast, Sekhmet, Mut, and Hathor. She was the tutelary deity of Lower Egypt and the major Delta shrine the "per-nu" was under her protection. Hathor is also depicted with this eye. 5th Chakra: Speak your truth! 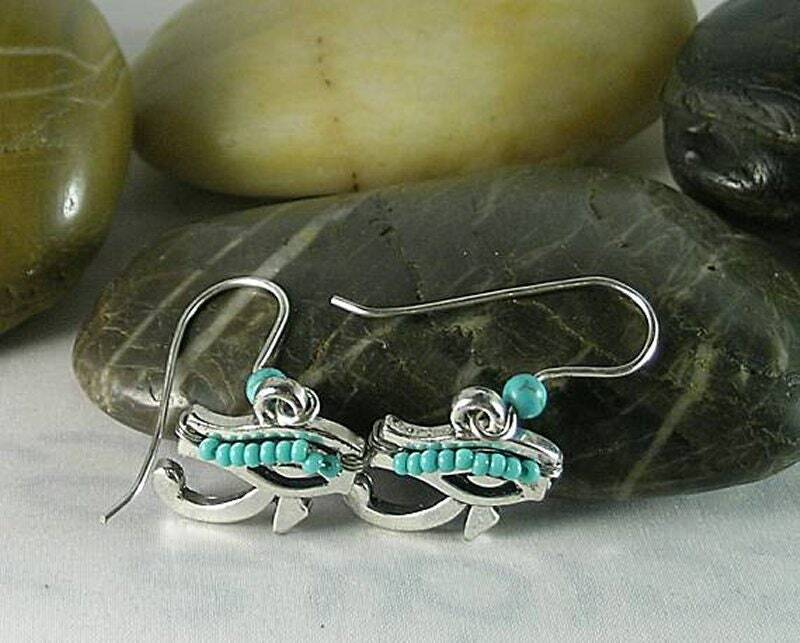 Turquoise is said to contain the spirit of the creator within it. Use it to create energy in the Throat Chakra. It will heal any tendency to lose energy and help deepen a commitment to telling the truth.